One hour of dank and clammy Swedish drone from Keränen, who spends the entire disc describing the lurid lighting effects of the Moon Over Torrelorca (LJUD & BILD PRODUCTION LBP002). 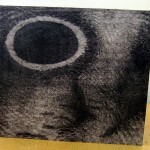 The grey cover image entirely reflects the nature of the music, a charcoal drawing which in its semi-abstract way conjures up a black moon hovering in a sky that feels almost solid – perhaps clogged up with fog, smog, and life-threatening clouds of pollutive filth. This was recorded at the EMS electronic music studio in Stockholm, and Keränen must have spent many long hours labouring behind the digital capstans to produce this layered, burnished and near-oppressive sound. He applies filters so slowly and abstemiously, you’d think they were dispensed on a meter charging system at the EMS. Last heard from this guy in 2010 with his Bats In The Attic release for Pica Disk, which as I recall was quite a spiky package of strident noise; this Moon item is far more restrained, but still packs quite a wallop, even if the metal fist collides with your chin in slow motion. Good old Dmytro Fedorenko used to co-manage the Nexsound label with Andrey Kiritichenko until 2007, and thereby kept my ears fed with fascinating musical reports of electric drone from the Ukraine. He’s been highly visible lately thanks to the Kvitnu label which is carrying on the Eastern European agenda with great purpose and import. Myths & Masks (KVITNU 18) is a showcase for eight Ukranians, all of them paying their musical and sonic tributes to Karol Szymanowski. No, I never heard of him either, but that’s our loss because this Polish classical composer who died in the 1930s is reckoned to be every bit as important as Chopin in his homeland, and the Director of the Polish Institute has personally endorsed this CD project thus confirming its cultural worth. The young musicians here are not classical pianists like Szymanowski, but have found ways of using their digital equipment, laptops and synths to abstract meaningful strands of information from Szymanowski’s work – whether it’s “emotional melodic structures”, “stylistic aspects” or the exploration of “new musical and harmony ideas”. Each contributor has a strong idea and vision; what results is some fascinatingly diverse experimental electronic music, each piece underpinned by a different conceptual structure. Of the names here, Andrey Kiritichenko, Kotra and Zavoloka are familiar to me; the others are Dunaewsky69, Nikolaienko, V4wenko, Ujif_Notfound, and Alla Zagaykevych. The latter has studied at the Kyiv Conservatory and at IRCAM; her ‘Mithe IV: K.S.’ is one of the most intriguing and starkly beautiful works on this set, featuring the violin work of Smovzh Orest in amongst a superbly dramatic swirl of electro-acoustic sounds, to create a powerful musical allegory full of symbols. Gorgeous embossed package design by Zavoloka too, with booklet of notes and photos bound in. A timely and effective affirmation of the meaning and power of modernist composition. History, continuity, influence, progress; this is how culture is supposed to work. From Philadelphia, Starcircleanatomy (i.e. 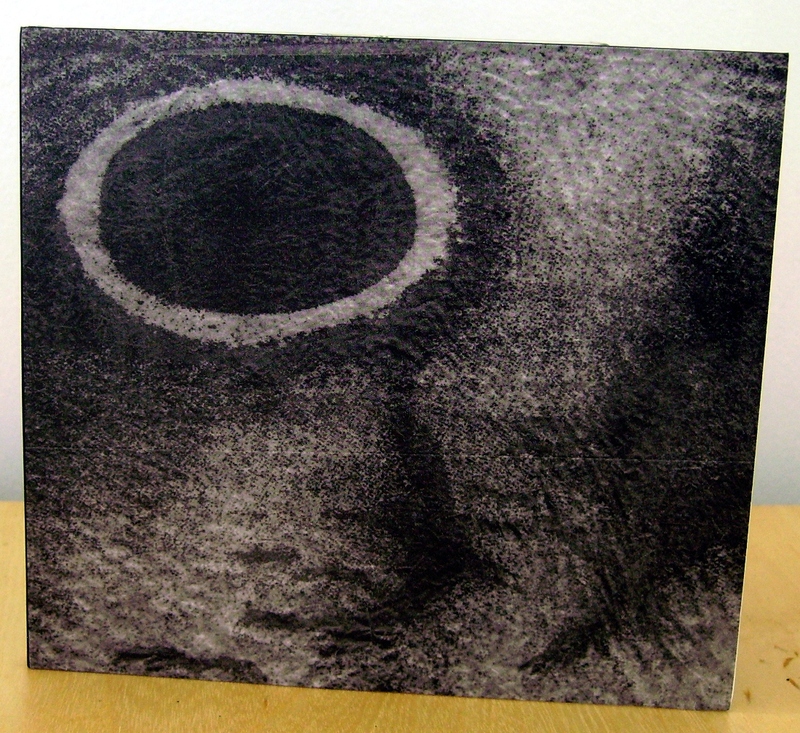 Izaak Schlossman) comes to us with Cold/Path (DEBACLE RECORDS DBL062) after a few years releasing cassettes and CDRs. His electronic music is in the dreamy-ambient mode and while his basic sounds may not be that inventive, his skill lies in the way he blurs and layers his edits together. You may not notice at first, but he is subtly disrupting the normal flow of musical information in engaging ways, particularly on the opener ‘Cold Gold’. Another successful piece is ‘Unline’ with its buried guitar loops and other elements which are gradually revealed within its pulsating rhythms. Lightweight techno music overall, infused with vaguely upbeat and sun-drenched impressions. Glaswegian band Tattie Toes have released Turnip Famine (EGG 78) for Pickled Egg, a release which perhaps represents a slightly left-field departure for this label which has been home to lively and idiosyncratic pop music for some years. Tattie Toes are certainly idiosyncratic, blending various forms of folk music and song into their short compressed songs which often change tack two or three times in as many minutes. All-acoustic instrumentation is their choice – violin, accordion, bass and drums, plus there’s the extremely mannered vocalising of the Basque singer Nerea Bello. The band are versatile as heck too, and you get the feeling they could play you a song by Caetano Veloso, a Romanian gypsy dance tune, a Scottish sea-shanty and then do a Hungarian outlaw ballad as an encore, simply in response to requests from the crowd. I do like the sound of the blended instruments, especially the wayward violin and vocal effects (often it reminds me of Art Bears), but overall the pace of the album feels sluggish; they don’t really swing or rock out, even the lively songs collapse into a dirge quite quickly, they indulge their quirks once too often, and the singer’s mannerisms can become quite grating. Steven Ward did the recording, and while I imagine they’re pretty entertaining live, I feel the positive aspects of their energy haven’t quite translated successfully onto this release, and it fails to catch fire. The cover is nice; it’s a collection of their “trinkets, heirlooms and inanimates” which they have been curating and treasuring for years, treated to look like an old faded photograph. Next Post:TSP 20 is out!